First a quick mention about the Red Wine Jelly I posted yesterday? I was having some site issues and a lot of people couldn’t get to my site; so hope this link reminds you because that jelly is…THE BOMB! Anyway, back to now. A couple of years ago I was devastated when the local grocery where I shopped closed their doors. It was not too big and always had nice, fresh produce which is pretty much the most important asset for me at a grocery store. Not too long after that a sign appeared indicating that the space would soon be filled with a Sprouts Farmers Market. This was a new name for me in Denver and while it sure sounded appealing, only time would tell right? Fast forward and it’s one of my favorite places to shop and son of a gun…their fresh produce is just the best. I lucked out! So when I heard from them asking if we could work together on a recipe during the Final Four Basketball Tournament I was excited. It’s easy to wax poetic about a brand you really love and was made even more enticing because I will always feel a connection to the Final Four; it seemed the timing was perfect. Win win. Before moving to Denver I lived in Raleigh, NC for ten years. I moved there from St. Louis, a big baseball and football town to a much smaller city in the Southeast. When I first heard and saw people who were fervent about ‘backing the Pack’ I foolishly thought they meant the Green Bay Packers even if I struggled to understand the connection. As the Final Four approached and every retail establishment in town had games playing over the intercom I finally asked about the correlation and that was my first introduction to the fact that I was living in the land of college basketball. We went to games and cheered with the best of them and since leaving that part of the country; I still like to hear who is a contender and every year I’m hoping one of the regional schools that had been near us; either the North Carolina State Wolfpack, The University of North Carolina Tar Heels or the Duke Blue Devils, have made it to the finish line. The Final Four tournament was held in Denver many years ago and while I did not actually attend the games, I went with friends one weekend night down to Larimer Square in Denver and we watched and rallied at a bar on Larimer Square. 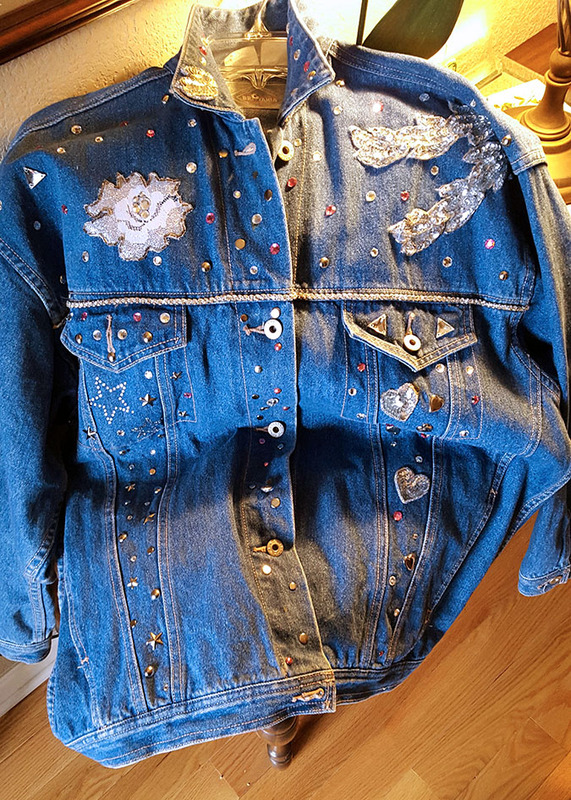 I was running a small apparel business at the time; doing custom and semi custom work on jackets, sweatshirts, leggings and jewelry and I made this jacket just for the occasion. Oh yes it was that time…glitz EVERYWHERE! Despite the urging of everyone under the sun to KonMari it…I refuse to give up this jacket. It’s a great memory and maybe one day it will mean something to my kids because I have so many hours of my handiwork invested in it. Yeah, that’s my excuse for keeping it. I know that trend is over but I still sort of love this thing; that’s the real truth. So here we are this year and it’s definitely a feeling of deja vú and I’m back rooting for the Tar Heels who are one of the Final Four playing on Saturday. I might just wear my special jacket for good luck and I know I’ll be making these Apple and Honey Chicken Sausages with Guinness Grilled Onions again. 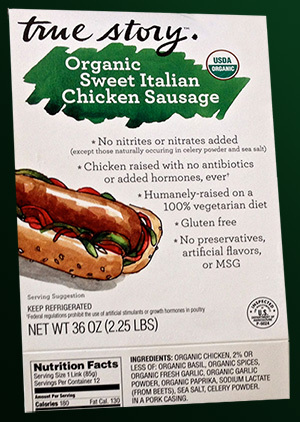 The sausages are from True Story, a brand carried by Sprouts that are all Organic. Quite frankly I’m not a fruitcake about all organic but I do read labels and labels that contain real food are what appeal to me. That the production animals are raised humanely tops my list; I can do without more if it means more of this. Since the sausages I used contained both apples and honey and were on the sweet side, I decided that I had to add more savory ingredients to the mix. I first topped the sausages with white cheddar cheese and put them in the oven to melt the cheese. 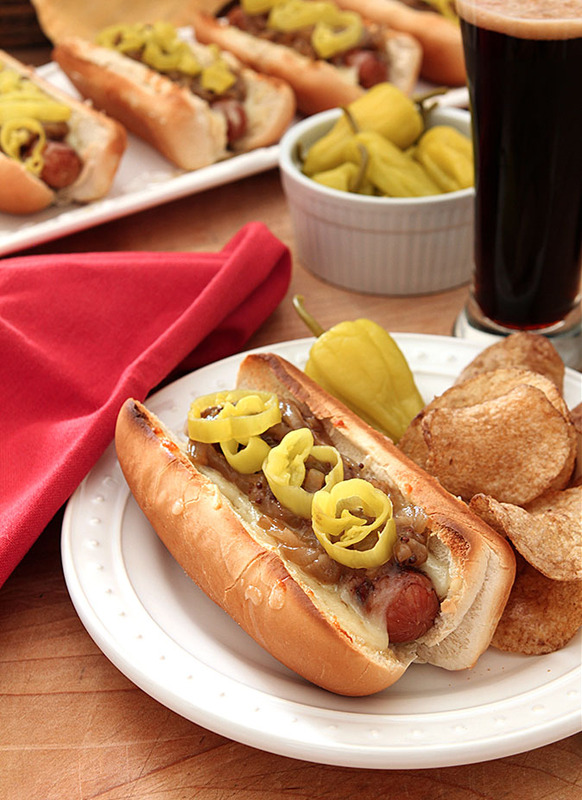 When they came out they were topped with a sweet onion mixture that included whole grain mustard and Guinness Beer. 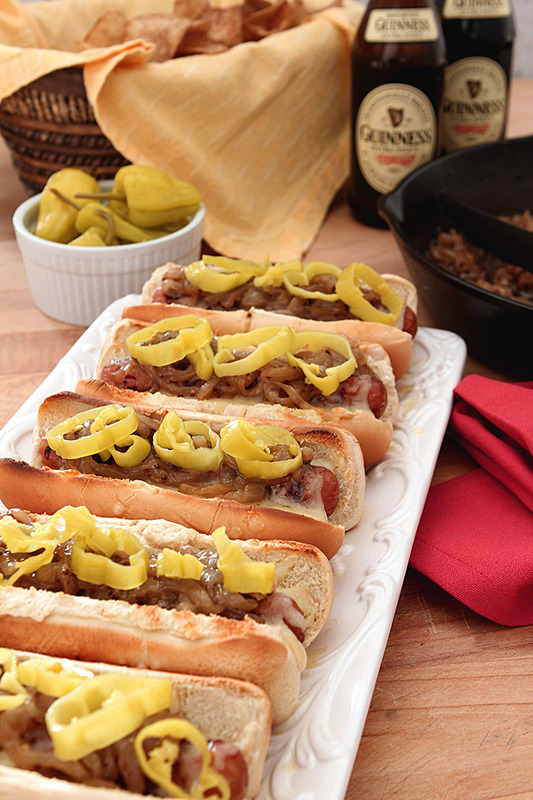 Seriously…you will never want plain sauteed onions again after trying these. One last touch were some sliced Pepperoncini and it was one delicious bite. Some sweet, some savory, a bit of crunch and all good! I picked the chips up from Sprouts too. Or they picked me. I just love Guinness Beer…was that bag of Guinness Chips calling my name in that further aisle? Because I heard something beckoning and when I arrived I was powerless to resist. They are so worth finding. Are you a fan of college basketball too? Are maybe just a fan of a great meal? Either way, this one works deliciously! Melt the olive oil and butter together in a large skillet. Add the sliced onions and saute for 15-30 minutes until soft and the moisture has evaporated. Add the minced garlic and saute for an additional 2 minutes. Add the mustard, honey, balsamic vinegar and beer to the onion and garlic mixture and cook on medium heat for 10 minutes until mixture has cooked down and most of the liquid has evaporated. Preheat the broiler and put the rack in the middle of the oven. Grill the sausages (or hot dogs) until done with nice grill marks. Put the meat inside the open buns and sprinkle with the white cheddar cheese. Place in the oven and warm just until cheese starts to melt; 3-5 minutes. Remove and turn off oven. Top the sausages with a big spoonful of onions and then sprinkle with the sliced pepperoncini. This is a sponsored post on behalf of Sprouts Farmers Market but all commentary is my own. Oh my goodness, this just immediately made me hungry!! Wish I could have these for lunch right now. YUM! They were so good Kate; just the right mix of sweet and savory but still easy. I’ll be making those onions again; they would be good with any grilled sausage or beef dish. The NCAA basketball tournament is one of the best sporting events going! Anyway, this looks wonderful — but then I say that about anything that contains Guinness. 🙂 Really like the inclusion of balsamic vinegar too. 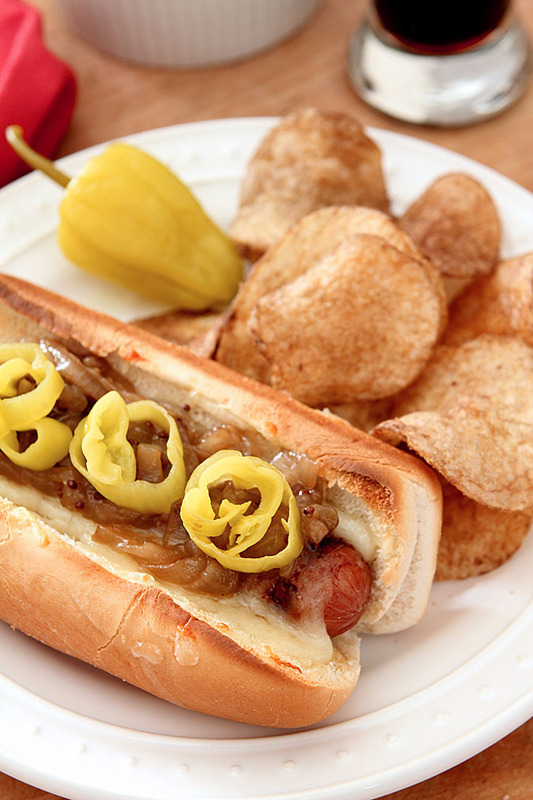 I really love sausage meats with a sweet element and the honey and apple sure did that but those onions. OMG those onions. They would make cardboard taste good.